Alice Kelsey is a full-time artist working primarily in oil and pastel in a colorful and expressive abstract impressionist style. Kelsey’s work is exhibited regularly and receives awards in national juried exhibitions, and is recognized with signature membership in the Maryland and Central Pennsylvania Pastel Societies. 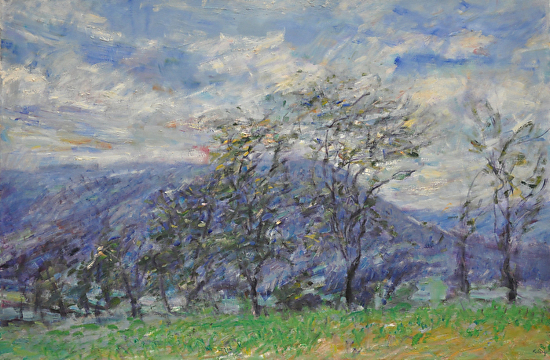 She was recently selected by the Palmer Museum of Art as a featured artist for the museum’s Gala Event, and her work exhibited in solo shows at the Pennsylvania State University, The Bellefonte Art Museum, and Lancaster Galleries, as well as an Invitational Exhibit at the Art Association of Harrisburg. Kelsey grew up in Chester Springs, Pennsylvania, and graduated from Westtown School. She received a B.A. degree from Hamilton College, focusing on biology and art, and an M.D. degree from Michigan State University. She lives with her husband and three children on a small farm in central Pennsylvania, and enjoys hiking, gardening, horseback riding, and flyfishing in addition to her passion for painting.